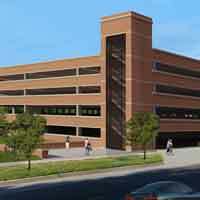 In the next week, a significant milestone will be reached on the Parking Garage Expansion Project. Work crews will have the structure half-way finished by the end of next week. The last of the precast erection for the south half of the garage will be completed today. Grouting and welding crews will continue there one week further. By Friday, the garage will be 50 percent complete. The crane will be relocated to the Northwest corner of the project site on Monday (Dec. 19) and begin to pull off the last bay of spandrel panels on the existing garage. For safety reasons, a few parking spaces on the east side of the garage will be temporarily blocked. Those spaces will be restored by the second week of January, when undergraduate students return to campus. Conduit for the new garage lights continue to be installed. During the holiday break, construction crews are going to take advantage of the mostly-empty campus and complete some saw cutting, underground plumbing and concrete pours. This will be done during the break to minimize disruptions to the campus. Crews are expected to complete the framing of the walls on the second and third floors in the next few days. That work will continue on the fourth floor through early January. Drywall is being installed on the first three floors this week and will start on the fourth floor next week. That work is expected to last through early January. The last of the ductwork installation on the third and fourth floors is expected to be completed next week. It will continue on the first floor through Jan. 7. Fireproofing material is being sprayed on beams this week and next week. The last remaining door jamb is scheduled to be completed on the third floor today. The roofing materials will be installed starting December 20th.